Ikea furniture hacks are all the rage right now. 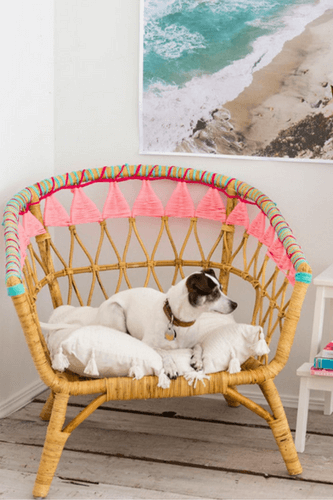 Blogs like Ikea Hackers show their readers creative ways to make inexpensive pieces look like they cost a fortune. As a result, a new decorating trend has emerged. Anyone can harness their inner designer and fill their homes with stylish furniture for any budget. The journey is both frugal and rewarding. 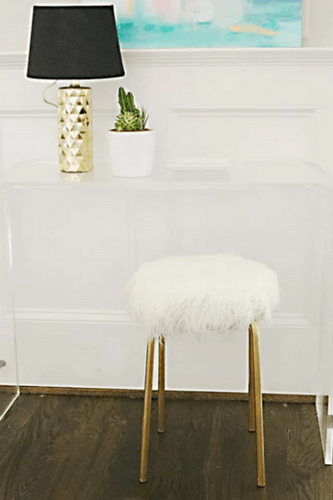 Glam fur stools are everywhere lately, and this one is simple enough for even the most non-crafty person. The stool is from Ikea’s Marius line. 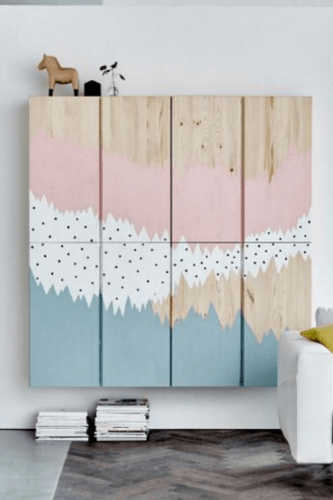 For this creative storage unit, start with two Ikea Ivar cabinets. The beauty of this piece is that you can personalize it in a number of ways. If you’re not a painter, just use wallpaper. Putting all the finishing touches on this magnificent chair admittedly takes some time, but the results are worth every moment of effort. And there’s a fascinatingly watchable GIF tutorial for inspiration. 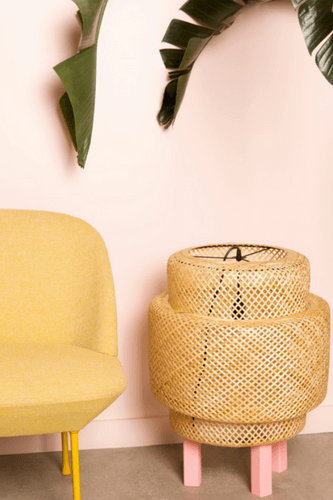 What could be more fun than assembling this ridiculously pretty floor lamp from an Ikea Sinnerlig pendant lamp? All you need is a lighting kit, premade furniture legs, spray paint, and glue. 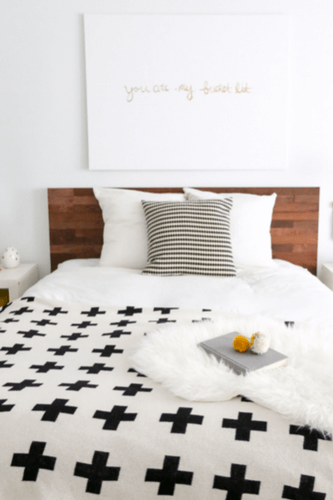 The blogger who created this headboard masterpiece used a product called Stikwood to cover the Ikea Malm headboard. It’s a little more labor-intensive than some of the other projects, but your bedroom will look incredibly gorgeous when it’s finished. We think this trendy dresser is just precious. 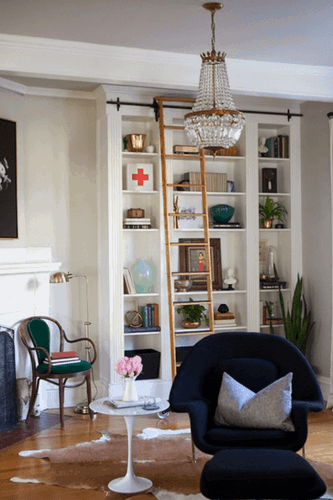 It all starts with an Ikea Tarva dresser, but the dramatic improvements come from altering the legs, painting the piece, and adding modern hardware. Who would’ve guessed that this expensive-looking built-in is actually comprised of Ikea Billy bookcases? Matching trim really brings the wow factor to the entire room. If you search “Ikea Lack hacks,” dozens of tutorials will appear. We like this one because of its ease, simplicity, and price tag. For a completely different look, cover it with marble contact paper or Stikwood. 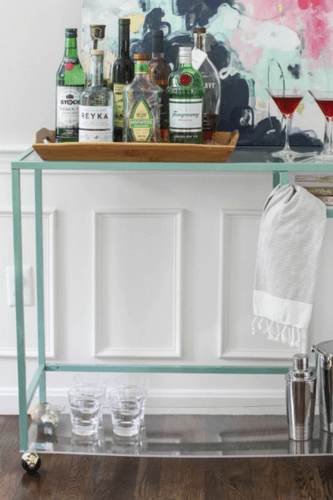 This bar cart looks like a million bucks, but it starts with an Ikea Laptop table. Jade paint and acrylic give it a modern flair. Not a drinker? Use it to hold pretty bath items, books, or coffee paraphernalia. 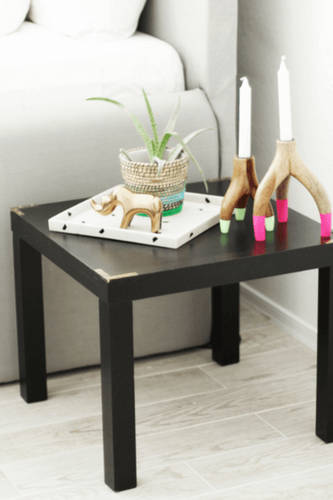 We think any of these Ikea furniture hacks would look stunning in your home. Be sure to tag us on social media if you try any of them out! Are You Moving In the Houston Area? Finding a reliable local moving company should be first on your list. Ameritex Movers is the top choice for Houstonians due to our knowledge of the area, up-to-date moving techniques, and stress-free guarantee. To find out how Ameritex can make your moving day an easy experience, call us at 713.484.6673.